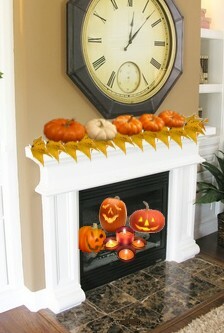 Turn the fireplace into a focal point, by cleaning it out, and then arranging carved pumpkins or jack-o-lanterns, and orange and black pillar candles inside. Light the candles and close the screen. The Jack-O faces should be according to your party theme – scary or friendly.